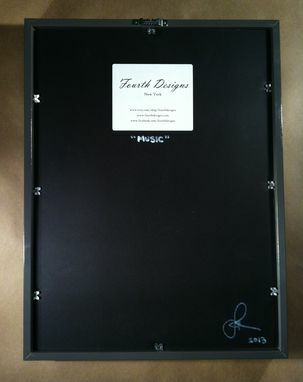 The project that is pictured is titled "Music". 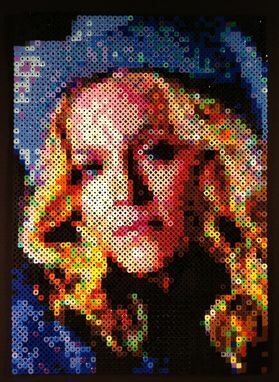 This portrait is made of approximately 4000 beads. The images shown are of Madonna but any celebrity, person, or object can be recreated in beads. Once framed, this piece measures 16 5/8" x 12 5/8". I will design a large custom portrait for you based on your photo or request. Prices vary based on size and complexity of the project. If the subject is fairly popular (like an artist that isn't currently featured on my site) you can also submit a request and I will design a portrait based on available images. 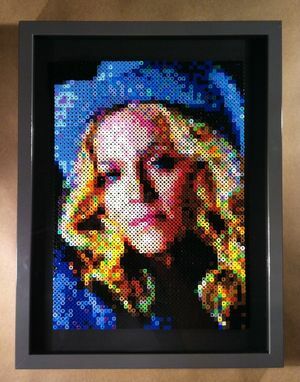 The final portrait can be a range of sizes based on your budget, preferences and the composition of the image that will be created in beads. -Photos of people should be high resolution and have a clear image of the person's face. -Photos of people should not have anything obstructing the face, like hands or other objects, unless you would like to have that included in the portrait. -Photos should have appropriate lighting (not too dark and not too bright). I may alter the coloring in the photo slightly to make your portrait the best it can be. Any alterations will be discussed with you before the design is finalized. This piece will be mounted and framed before shipping. All you have to do is hang it and enjoy! If you have any questions before placing your order, please feel free to send me a message and I will answer your questions as quickly as possible!